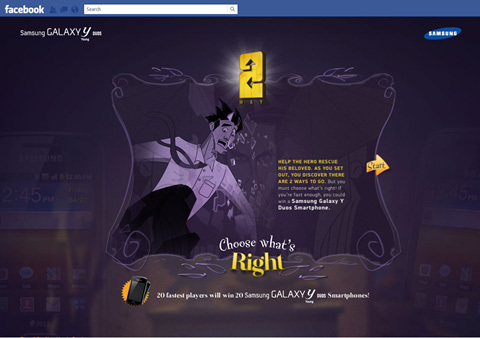 Samsung’s latest digital campaign promoting Galaxy Y Duos (the new dual SIM Smartphone) employs a Facebook Game to reach out to and engage with Gen Y on Facebook. Samsung 2WAY, ‘Choose What’s Right’ Game amplifies the campaign theme of taking up challenges and making the right choices to solve them. Users need to help the hero in his mission to rescue his beloved by making the right choice at every stage with two options to choose from (the obvious Duo connection). 20 players with the best time, stand a chance to win Galaxy Duos. The options are animated videos and everytime you pick the wrong one you have to play all the videos again, which ends up testing your patience after a point – especially if you consistently get the options wrong (ask me!). Also if time is of essence here to win, there should have been a timer throughout the game. Even after the game ends, you are not given the time you clocked to finish it. It might have made sense to take the user to the Samsung website or the Facebook Brand Page once the Game ends. The thought and execution are nice and the game can be a fun one-time play. It reminds me of ‘The Date Fillum’ from Cadbury 5 Star though that was a Youtube Web Video Series. You can also watch the animated Game videos on Samsung India’s Youtube Channel.